So many flowers blooming. And now it is Garden Bloggers Bloom Day. I have quite a few more things that are blooming in my Zone 8 Garden this lovely August morning. Most of them were here when we moved in three years ago, and I don’t have the names of them…just suspicions. I’ll share some of the roses that are in my garden. Last year we were beset with all kinds of black spot, but this year, even with the very wet conditions, my roses are relatively black spot free. The first is this creamy beauty that has been giving me flowers all summer. This Perky Pink Rose is the sweetest thing. It is a miniature rose and does not give many blooms, but they are so cute. I just love this rose. And this Pink Rose has pale pink blooms and is very floriferous, blooming all summer. I love Rugosas and this Rosa Rugosa is my favorite. I really love the large rose hips which are bright red in fall. I plan on making rose hip jam this year. Not sure of the name of this Purple Clematis, however, I believe that it may be Jackmanii. I was not given a name by the previous owner of our house. Any opinions whether I am right? Feel free to leave a comment. 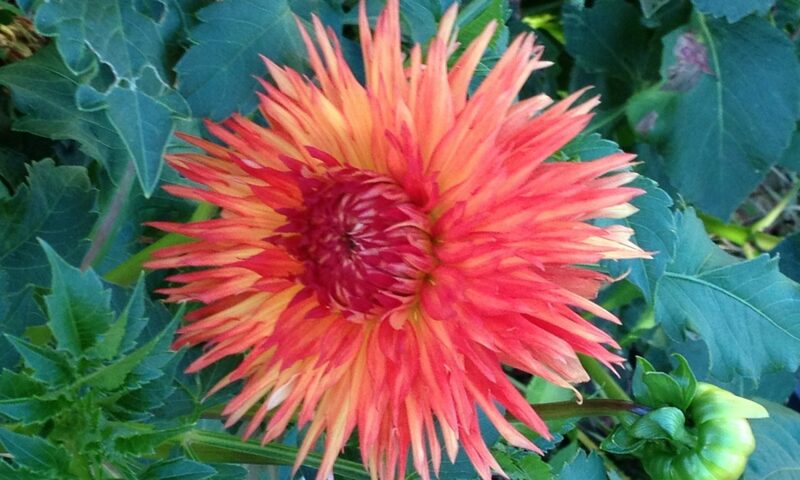 This cute dahia is supposed to be Dahlia Lorana Dawn, but it does not look like the picture on the bag we bought the tuber in at all. (Of course, not that any plants really look like the picture. Anyone have this one who knows? Again, feel free to leave a comment. Well, that is what is blooming in my Home Garden on Garden Bloggers Bloom Day. You might want to take a look at some of the other lovely gardens on this garden tour of other bloggers at May Dreams Gardens. Thanks for dropping by and thanks for lending support for my suspicion that this is Clematis Jackmanii. Hello enjoyed your blog I live and garden in hot zone 9 in Arkansa we have to water every 4 days we have soaker hoses. We have a 3 hose hook up. Love roses we have 60 bushes. look at my blog pages.